I am currently an Elementary Education major at Endicott College, living in Plaistow NH. I absolutely love working with kids and am hoping to gain a summer nannying/babysitting job. 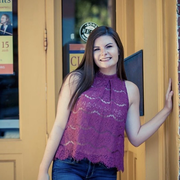 I have a lot of experience working with children such as 3 years as a camp counselor at Plaistow Recreation, helping out in after school programs, assisting dance classes, interning in elementary school classrooms, and babysitting.